Where are they building luxury apartments you'll never be able to afford THIS week? The smell of fried fish hit me as a new bus passenger walked past my seat. At first, I wondered where they could have brought the smell from, but then I realized we were at a stop nearby St. Augustine of Hippo, meaning they probably had just eaten a pretty awesome fish fry in its basement. I chuckled as I remembered I too had smelled like fish after eating there—the smell had been so strong that I had changed my clothes before going out for the rest of the evening. The bus continued and dropped me off on the East Side, but I wasn’t staying there. I was riding with a friend out to West Allis, and we were going to Kegel’s Inn (5901 W. National Ave., 414-257-9999). Opened by John T. and Anna Kegel in 1924 as a “soft drink parlor,” Kegel’s Inn was originally known as Kegel’s Place. During the days of Prohibition, “soft drink parlor” often meant speakeasy, and Kegel’s Place served up beer and whiskey. Today, Kegel’s proudly highlights their speakeasy roots on their website, and you can see a ticket that Anna was given in 1927 for possessing liquor. Beyond this, I found a few examples of Kegel’s getting raided during Prohibition. According to the February 13, 1930, edition of the Milwaukee Sentinel, “the dry sleuths confiscated seven half barrels of beer, two thirty-gallon crocks of beer, one fifty-gallon crock of brew, and five twelve-gallon containers of the same beverage” from Kegel’s during a raid. On April 7, 1933, with the implementation of the Cullen-Harrison Act, states were allowed to pass laws permitting beer with up to 3.2% alcohol content to be sold. As if anticipating the end of the long national booze-less nightmare, Kegel’s began working on a transformation of their building shortly before this, and expanded it into a restaurant, which opened on August 26, 1933, as Kegel’s Inn. On December 5, 1933, Prohibition was repealed with the ratification of the Twenty-first Amendment, and Kegel’s and the rest of the country could once again serve liquor without fear of being raided. Kegel’s has continued to do so, and also serves German dishes and Friday fish frys, and are now in their fourth generation of ownership. Unlike the last time I walked into Kegel’s Inn, this time I had a reservation. It was for 7:30 p.m. and I had arrived five or so minutes early, so I started off by ordering an Old Fashioned at the bar. I didn’t catch how it was mixed, but no fruit was muddled at its bottom, although it had an opaque appearance. It seemed to be unusually sour tasting for being ordered as a “sweet,” but overall it was fine. There is a dining room adjacent to the room with the bar, with large beautiful murals painted on its walls. There is also some seating in the same room as the bar, and we were seated there shortly after our reservation time. The Friday fish fry menu has the following options: cod ($12.50 for 4 piece / $14.50 for 6 piece), baked cod ($15.50), walleye ($14.50), blue gill ($15.50), lake perch ($16.50), jumbo shrimp ($13.50), and a seafood platter with perch, cod, scallops, and shrimp ($16.50). Potato options include homemade potato pancakes, German potato salad, a baked potato, or french fries. Spaetzle or a dumpling can be substituted for a dollar. I went with the six piece cod and potato pancakes, and added on a cup of clam chowder ($3). Almost all of the food was noticeably better than what you’d find at a typical fish fry, mainly on account of its flavor and texture. The chowder had an average amount of carrots and clams, and its consistency was comparable to many chowders, but what hit me was its flavor. It was some of the best tasting chowder I’ve had in recent memory, and it kept me longing for more. Two pieces of dark German rye were brought out right after the chowder was set down. The edges were dusted with flour, and the caraway seeds were loaded with flavor. This was some high quality bread—not just a loaf casually yanked from a store shelf. The pieces of fish were rather small, and had a light, almost crumbly breading on them. But at the same time, the breading held together well, allowing the pieces to be eaten like gourmet fish sticks. They were excellent in taste, being savory and yet having a touch of sweetness. They came with two cups of thick, relish-heavy tartar sauce. The texture is what stood out most about the somewhat mild-tasting potato pancakes. Their centers were perhaps more moist than any I’ve had before, and yet their outside brought an altogether different mouthfeel. The coleslaw was very lightly seasoned, creamy, and perhaps a little bit above average, but wasn’t as memorable as the rest of the meal. 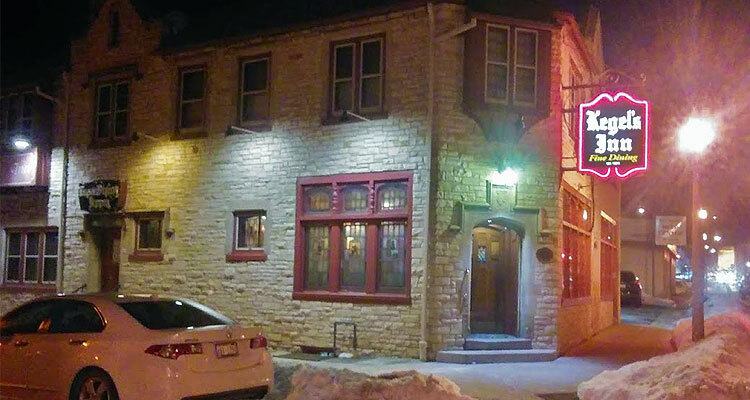 Like many places, Kegel’s Inn claims to have “Milwaukee’s best fish fry.” This is technically impossible since they are located in West Allis, but one can debate if they are the best fish fry in the Milwaukee area. In my view, they are definitely in the top tier of area fish frys, but I won’t go as far as to say they are the best, and I think a handful of places are better. Still, if someone said Kegel’s was their favorite place it wouldn’t surprise me. Every single aspect of the meal, except perhaps the coleslaw, which was still pretty good, and the Old Fashioned—if you count that as part of the meal—were well above average. The only thing that comes to mind that could be changed would be to put an all-you-can-eat option on the menu, as a six piece fish fry with smaller pieces of fish left me wanting more. Still, the price is reasonable for the amount you get, and even more so because of the quality of the food. 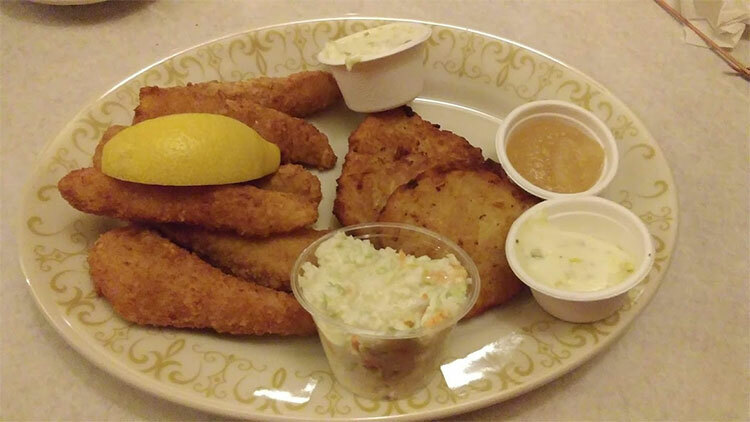 If you’ve never had Kegel’s Inn’s fish fry, add it to your list. Takeaways: Originally a speakeasy; family-owned in its fourth generation; they get packed on a Friday night, so it’s probably a good idea to make a reservation—check their website for some pointers; beautiful murals; flavorful chowder; real bread; excellent fish; the pancakes had some rad texture; I feel I have to mention this—my friend really liked the fish, except for one piece, which he thought tasted like “the industrial cleaning product used in Hobart washing machines.” He threw that piece off his plate. RECOMMENDED.